Home Other Articles Armenia: Where Is Armenia and What Is It Known For? 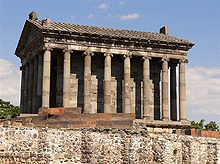 Hellenistic Temple Garni. It was built in the first century A.D. by the Armenian King Tiridates with the money he received after visiting Emperor Nero in Rome. The temple was destroyed in 1679 in an earthquake, but was reconstructed in Soviet times. A landlocked state in southwest Asia, Armenia lies in the south of the Lesser Caucasus mountains. It is bordered by Turkey to the west, Georgia to the north, the de facto independent Nagorno-Karabakh Republic and Azerbaijan to the east, and Iran and the Azerbaijani exclave of Nakhchivan to the south. One-third of the population lives in the capital, Yerevan, which is one of the world's oldest cities. It was founded in 783 BC, several years before the founding of ancient Rome, by king Argishti the First as Erebuni, the military and administrative center of the state of Urartu. The ruins of the fortress Erebuni are in the southeastern part of the present day Yerevan. Armenia is a mountainous country with a continental climate. Exports include diamonds, scrap metal and machinery. Many Armenians depend on remittances from abroad.